Although there seems to be no shortage of free targets out there with which to sight in our rifle, pistol or slug shooting shotgun there is a small collection I discovered a while ago that I think provide one of the best selections. These come from P Kammermann AG in Switzerland. The targets are free to download so, as long as you have a decent printer attached to your computer that will preferably handle thicker paper of about 200 gsm you’re in business. 80gsm on up can be used OK, preferably taped onto a cardboard backing such as a photocopy paper box or any cardboard box you can scrounge up that’s big enough. If you don’t have a target stand then a couple of house bricks in the bottom of the box should hold it down and then it’s shooting time; and as we all know “all time’s wasted that’s not spent shooting!”. Let’s have a look at a few that I find especially useful. This target I find wonderful for sighting in or practice with open sights. 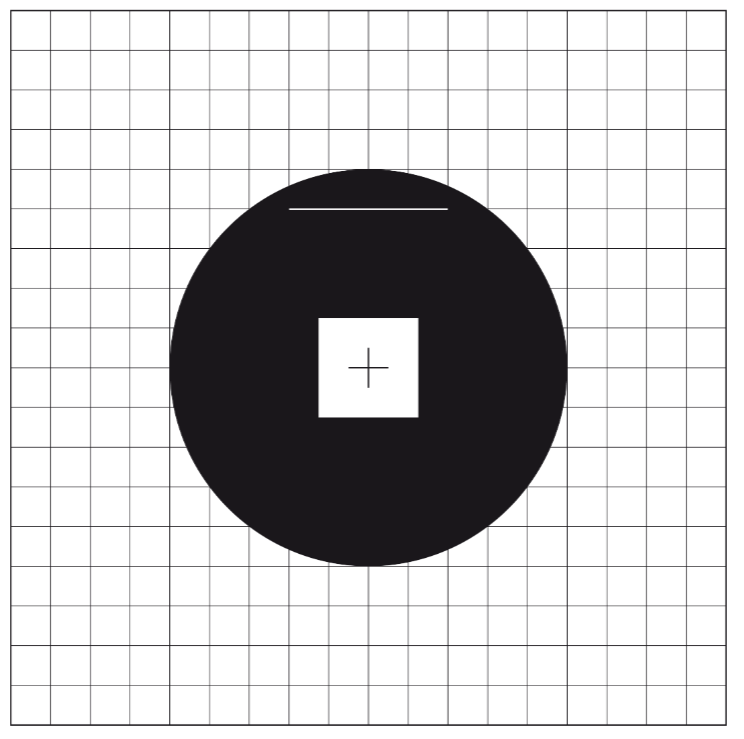 The flat bottom of the target circle means you can place your open sight picture along the base and have your shots printing 4cm or 1.6″ above your line of sight. 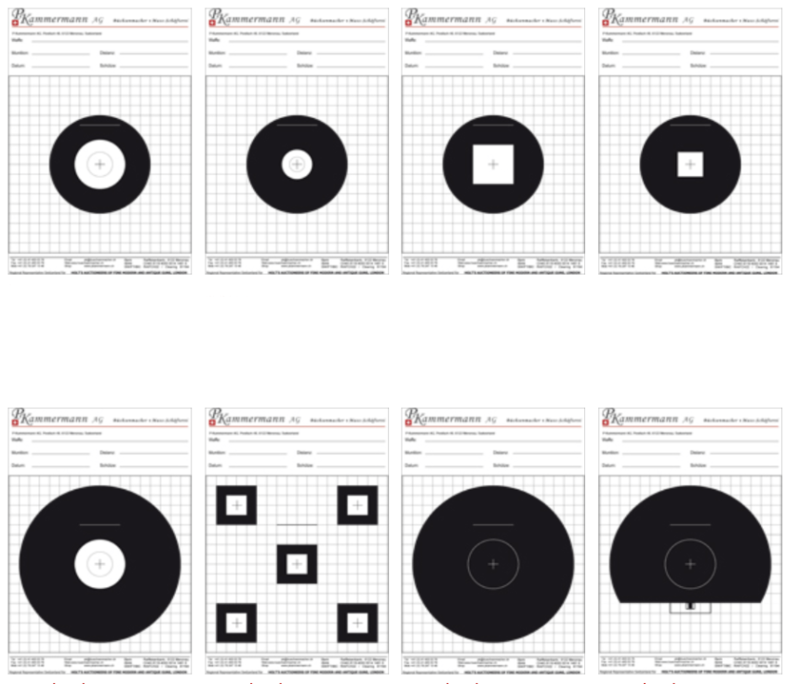 As with all these targets, although they are A4 paper size you can print them on American Letter size paper or larger paper if your printer supports it. In your Print Properties select the paper size you want and then ensure you find the option to scale the image to fit the paper size (usually called “Fit to Paper Size”. This target is really useful for initial sighting in with a rifle or slug gun with a telescopic sight. Print it on A3 or equivalent paper if you can. Set it up close, 10 yards is plenty. Bore sight the rifle, then start shooting from a bench rest or sand bag rest. As you will likely be making a lot of adjustments with a new scope on the rifle 3 shot groups are enough for each sight adjustment as long as the rifle is grouping as it should. 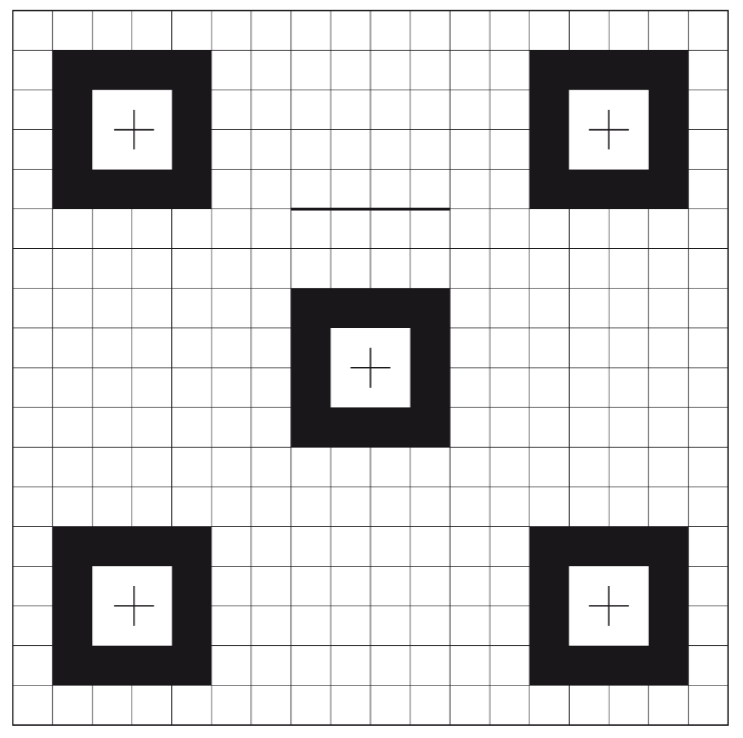 That big white square lets you quarter it with a crosshair or put a single post reticle in the center. Once you have the rifle zeroed you can then move to this target printed on A4 or American Letter size paper for zeroing at 100 yards. Printed A3 size this target is suitable for zeroing out to 300 yards. That’s the range I used to zero my 6.5×68 Schuler at. For zeroing at a full 300 yards you’ll want a scope that provides around 10x or better. I had a 3-12x56mm Nickel Supra on that rifle. You’ll also want a good spotting scope for checking your bullet placement or you’ll be doing lots of walking. I used to use a Bushnell Spacemaster. 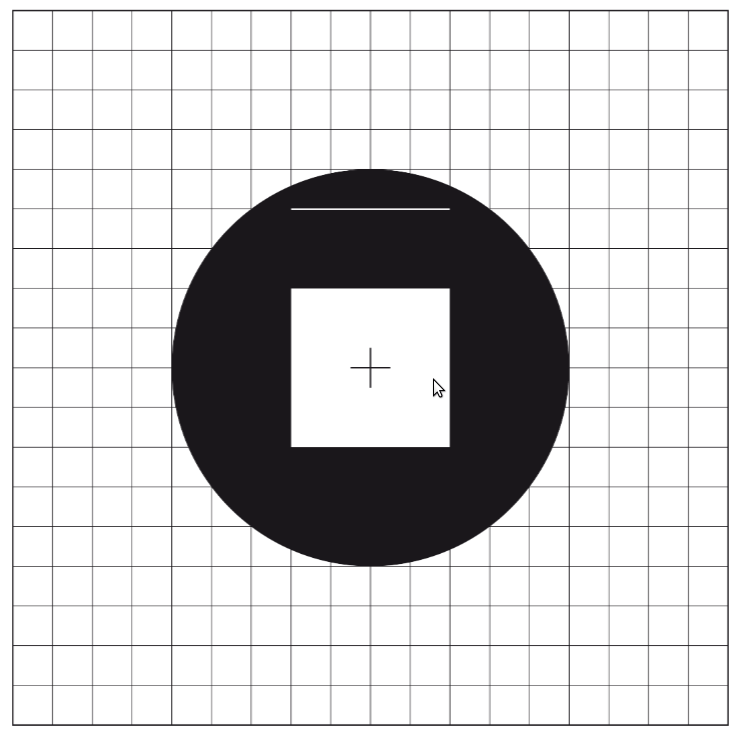 Once you have the rifle reliably chopping the white out you can move to this target to get the more fine aiming point of the smaller white square if you like. Whether you do this or stick with the one above will depend on the available magnification of your scope and the distance you are shooting at. 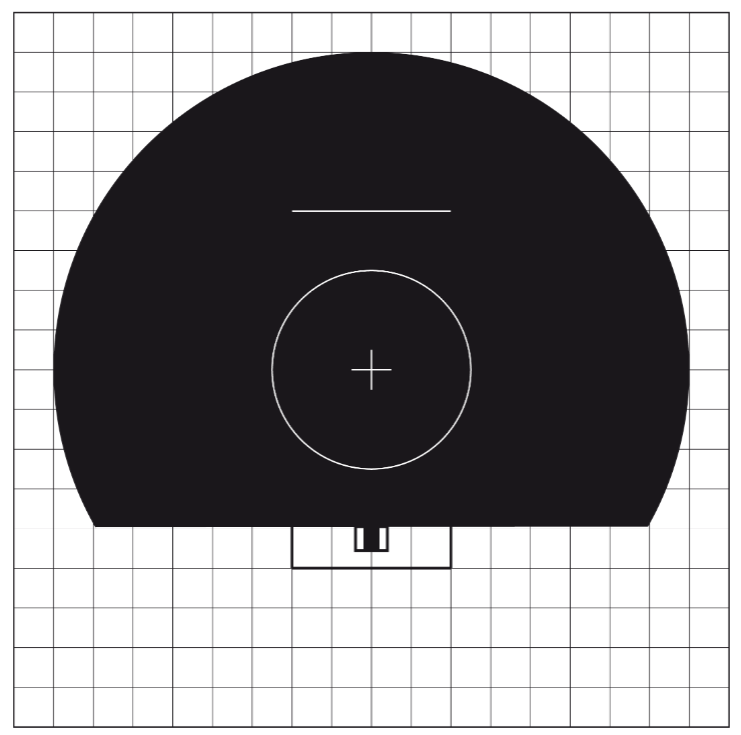 Printed on A4 or Letter paper this target is good for an already zeroed rifle that can shoot at least MOA (Minute of Angle) at 100 yards (or meters). On A3 or equivalent its good for 200 yards (or meters). These are targets I find most useful. I hope you find them useful also. When benchresting a rifle off an actual benchrest or using a sandbag set ensure you get the benchrest and/or sandbags set up so the rifle sits aimed at the target. Make your adjustments for elevation by using your left hand (for right handed shooters) to squeeze the rear bag (if the rifle does not have an unreasonable amount of recoil). I’ve regularly shot things of the .308 Winchester, 30/06 level like that without problem and I know that the various 300 magnums can be shot like that. Just use gentle pressure from the right hand to draw the rifle into your shoulder, left hand to squeeze or release pressure on the rear bag, and roll straight with the recoil. It is best co-incidentally to remove any protruding sling swivel that might snag on the bag as this will adversely affect accuracy. If you are shooting something with recoil at a level that requires a hold on the fore-end with your left hand then you can rest your hand holding the fore-end on the front sand bag rest and move the rifle forward to lower the elevation or back to raise it. I haven’t had the opportunity to benchrest a 600 Nitro Express double rifle yet but am told it is possible and would be keen to give it a go even if it did result in nosebleed, bodily injury, and hysterical laughter from all casual observers. In fact I’d want to stuff cotton wool into my bleeding nose and go back for more and let the casual observers die laughing. When benchresting consistent hold, breathing control, trigger control and follow through remain critically important. Just because the rifle is on a rest does not mean you can be casual about those basic items. Wind flags are a boon. They are cheap and easy to make using broom handles and red cloth. Set them up at 50 yard intervals out to your target, and learn to read them. With practice it is possible to sight through the scope with one eye and still watch the wind flags with the other one. Benchrest shooters do this all the time. If you are going to be doing any long range hunting you are going to need to zero at 200 yards or beyond, so it will be worth learning.